I finally got my Parkland Racoon finished! The next one I make will probably be more colorful/fantasy, but I still like the natural/neutral tones on this first little guy. Using the fusible fleece on the back of the fabric worked out well, but I'm going to watch and see how he stands up to a little wear and tear. The black fabric was more polyester than cotton, so the next Racoon I make I will definitely be pickier going through my scrap fabrics for his body, inner ears, eye mask, soles, and tail rings. I also sold one of the little Binky Boos I recently made, to a fantastic doll photographer (if you're on Facebook and are a fan of doll photography, you need to be following her!). She asked a question about making them even smaller, and I figured, what the heck? Let's start trying to miniaturize! I was going to wait until the weekend to start trying, but the bug bit me yesterday evening as I looked at my smaller felt scraps. 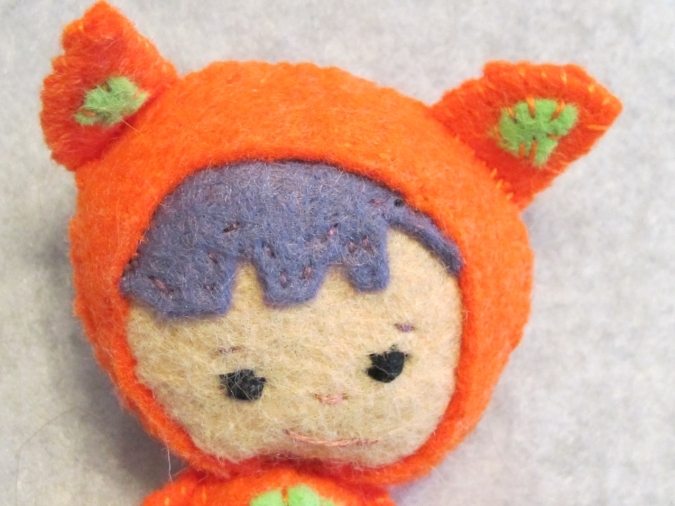 Here is the first result, which turned out pretty cute. I hand embroidered the eyes, but next version I think I will use seed beeds, or see if I can find even smaller safety eyes. 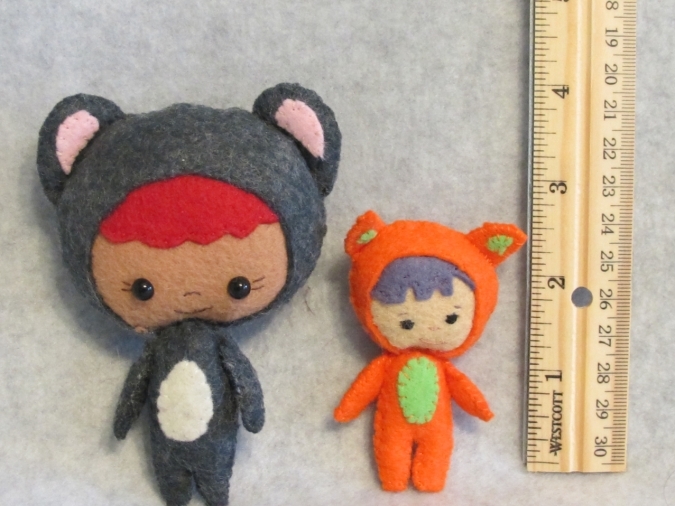 The pic below shows the mini guy in orange next to a "regular" sized gray bear. The mini isn't quite half the size. The mini Binky Boo's little arms move, too. Little guy next to a U.S. quarter for scale. Older PostTonner's Basic Patsy #4 Auburn Doll Has Arrived!